Earlier this summer, when Fox Sports announced that they were replacing veteran NFL sideline reporter Pam Oliver, a 53-year-old black woman, with Erin Andrews, a 36-year-old blonde woman, many noted that the change seemed more than a bit suspect. There was no news that their panel of balding, and grey-haired male anchors were going anywhere — just saying. Fox did agree to let Oliver complete the 2014 campaign — marking her 20th season as a sideline reporter — but cut her from the "A" crew of veterans that she had worked with for a decade to the number two team. 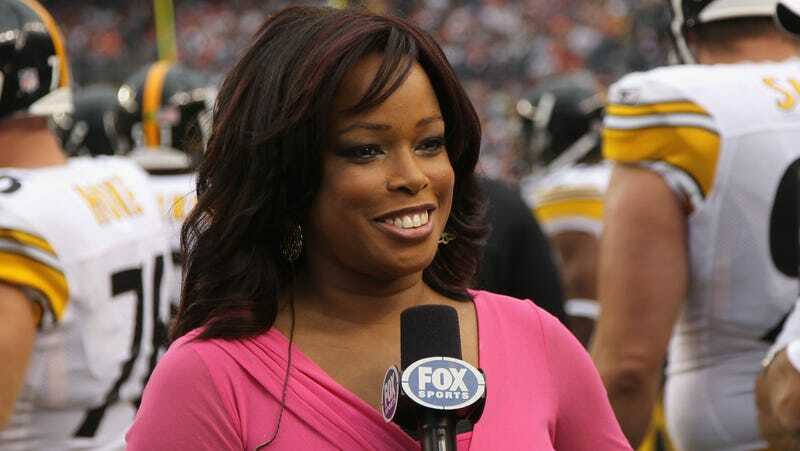 To be fair, no one, Pam Oliver included, ever discredited Andrews' ability to the the job. They simply questioned her ability to do the job better than Oliver. When the decision was announced in July, Oliver largely kept quiet, but she recently sat down with Essence for her first interview since the announcement. Coming off as the consummate professional that many have known her to be, she discusses her initial reaction to the news (tears were involved) and how she eventually came to accept the outcome and move on. Oliver reveals that she was aware of the rumors about her inevitable demotion before being officially told. The hiring of Andrews away from ESPN in 2012 was taken by many to be a sign that Oliver's days were numbered. Colleagues, and even coaches and players, would come up to me and say things like, "Boy, you're handling this well. You're really a class act." But I let the rumors roll off my back. Without official confirmation about a change in my position, I decided I was going to do my work like I always had. Still, I was humiliated. Oliver doesn't believe that race played a factor in Fox's decision, but she does feel that her age likely swayed Fox Sports executives. Once the changes were announced, people started talking. Some asked, "Do you think it had something to do with your race?" No. I definitely do not. Others asked, "Does it have something to do with your age?" Well, maybe. The business is very demographic-oriented. As one executive said to me, Fox Sports will look radically different in the coming years. I assume that means they want to look younger. Yes, because everyone knows that youth is a sign of competency and deep sports knowledge. It would be interesting to know if this pursuit of youth will apply to the men at Fox Sports as well. With everything said and done, Oliver says that she learned to let go of the slight and focus on the things head. At times I'm ashamed of how tragic I was making things out to be. It's just a job change. I'm not out on the streets. I'm not unemployed. Everybody wins: Fox gets its coveted reporter in the lead role and I get to do my sideline job for my twentieth and final year. I'm also looking forward to developing stories that interest me and delivering long-form pieces for FS1. That kind of work is like being in reporter heaven. After this season, Oliver will work on Fox's secondary cable sports channel, Fox Sports 1, delivering specials and long-form stories. Our society tends to admire those who display "class" or "dignity" when faced with discrimination, or at the very lest, in this case, preferential treatment. Oliver has shown both class and dignity in the wake of a decision that, by most accounts, doesn't hold much water. It also can't hurt that she's still on the Fox Sports payroll. I don't know of Oliver still truly harbors any negative feelings or not and she's right—it's not as if Fox Sports completely abandoned her. But I hate to think that she's tempering her response to avoid being accused of being catty or an angry black woman for expressing more anger or at least public disappointment in Fox Sports for a decision that was dubious, at best.